Most people use web analytics—you’d have to be crazy not to—especially with such powerful free solutions out there. However, for many people, analyzing their stats goes no further than rejoicing at having a few more visitors and repeating the figures to potential advertisers. But analytics, used properly, is so much more – it’s a marketing tool, an error checker, a usability tool, an ROI calculator, an eCommerce tracker, an ad tool and the list goes on. So we’re going to take a look at the basic ways of getting more from your analytics. First things first, if you haven’t got an analytics software set up, then for god’s sake what are you doing man(/woman)! Personally, I use Google Analytics, one of the most well known and best packages available with the added bonus of being free. But if you feel more comfortable using something else, there are many options out there to check out (you can start with this list of web analytics tools). Bounce rate is important. Very important. Don’t fool yourself into thinking that having a high bounce rate is fine because “it’s just a human choice thing”. Having a high bounce rate can be an indicator of serious problems with your site. It could be the web content or your calls to action that are ineffective in captivating and engaging your visitors. “What the hell is he on about?” some of you may be asking. For those who don’t know what bounce rate is, it is the number of people who, after arriving on your site, don’t look at another page and leave straight away. You’ll normally see this statistic represented as a percentage of your visitors. Now there is, as mentioned, a certain element of human choice about the figure; people will sometimes land on your site by accident or click a search result and find your site isn’t quite what they were after. That’s fine, and I’m sure you’ll be happy to accept that you’ll never get a 0% bounce rate – not without cheating anyway, and that’s no good. Combining this figure by looking at individual page bounce rates and bounce rates for different referring sites can open up your eyes to a large number of problems. A low bounce rate often shows a site that has content people want to read more of, and effective ways and site features that draw people in further such as a “related content” list of articles on landing pages or invitations to try the product with no strings attached. But fear not, bounce rates aren’t the beginning of the end for some types of websites. For example, blogs often have high bounce rates as people click through from RSS feeds and tweets with the intention of reading only that one web page. eCommerce sites though are a good example of sites that benefit from low bounce rates; they can draw people into looking at other products, reading more content on the site, and hopefully buying stuff. You should generally find out what is suitable in your niche. For commercial sites, that may be difficult, as people may not be willing to share their information, but certainly within the design community, don’t be scared to ask around. As a quick guide for most sites: a 30% bounce rate is a good figure, whereas over 50% could well be improved. However, if you’re a blogging site and receive traffic from social bookmarking sites, then it may well be much higher due to the way people often dip in and out of your site reading articles and then leaving, in which case 60% could be considered a good figure and anywhere from 70% – 80% is alright. Over 80% and I’d be a bit concerned. The best way to see if changes to your website’s design can improve bounce rates is by using A/B testing. The results can be seen for themselves with increased conversions. All the analysis of people visiting your target pages leads to the second important figure after bounce rate: the site conversion rate. If you have a clear goal for your site, then you should keep track of how many people fulfill that goal. If you’re running an eCommerce site, then it’s normally a completed checkout. For websites that require you to register for an account (Twitter or Facebook, for example) it’s completing the sign up process. For business sites, it could be a completed contact form. The conversion rate is another percentage, the amount of people visiting your site that are not just getting to your goal pages, but also carrying out the actions you want them to. When people first start to look at conversion rates, they are often surprised by how low they are; 3% is good conversion rate for completing a transaction on an eCommerce site. Yep, just 3% of new site visitors go through the checkout! If you have a clear path to your goal (e.g. a certain process of clicks or a checkout process), then set up a funnel and see where people are falling off. Where are they dropping shopping baskets? Where are they encountering errors on your web forms? It can be easy to highlight issues such as an overly complex form and other barriers to goal completion. If you don’t have a single set path, then compare where people come from to get to your goal pages. If many people arrive from one page but not from another, then compare both pages and look at their difference. Hypothesize why another page is successful, while another is not. Use A/B testing to verify your assumption, rinse, and repeat. Once you’ve established why people are (and aren’t) completing goals and you’ve fixed your issues and calls to action, then you need to look at where people are going after converting. Are they staying on your site or exiting? If they’re exiting, you may well be missing some huge opportunities (upselling, for example). At first glance, tracking your target pages may seem to be the same as keeping track of conversions, and whilst they are similar, these two site analytics stats have different values to you. We’ll use a hypothetical example for discussion: Mr. Smith and his online paint store. His conversion pages are obviously completed checkout pages (where he does of course try and upsell some accessories). His target pages, however, would be his product pages. For most types of sites, it should be quite easy to work out what your target pages are. For example, a blog’s target pages are its posts, and a business site will be its information pages. In most cases, these pages are the first major steps on the path to goal completion. Viewing a product is your first step to a complete checkout, viewing a business service is the first step to getting in touch and asking about the service. In order for Mr. Smith to convert site visitors to its completed checkout pages, he must first present his paint supplies in an enticing way. You should know how many people are getting to these pages and if they are completing goals from these pages. If not, where are they getting lost? It starts to become quite clear where a well-defined funnel can really help to benefit your analytics. Tracking site search is something very few people actually do, let alone pay attention to. Yet it can be a massively valuable resource for finding out what your site visitors want. Let’s look at Mr. Smith’s online paint store again. He stocks a huge variety of paints and a quick look at his search result reveals people are searching for “claret paint” that he doesn’t stock. It’d make sense to start stocking Claret paint, wouldn’t it? Or at least offer alternatives to Claret paint. The second part of site search analytics is determining what people do afterwards. If they head to the page they are searching for and stay on your site, then well done, your search feature is working. If they don’t, then there’s clearly a problem with your site search. It may not be returning the results it should be returning, or it isn’t displaying the search results in a useful way for the visitor to understand. Now, many people would say that if these visitors leave, then that’s fine because you don’t sell what they need. But we’re not most people are we? If Mr. Smith sells paint supplies and somebody has searched for a yacht, then they’re obviously just in the wrong website. 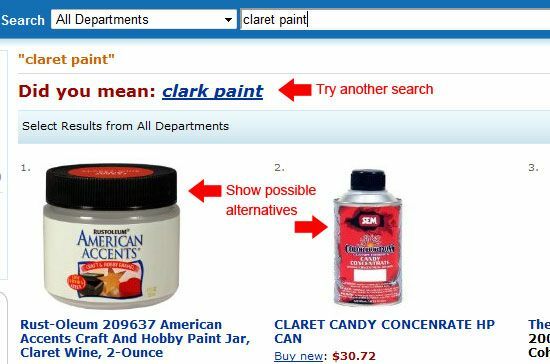 However, if they’ve searched for “claret paint” and left because you don’t have it, then surely you could be offering them an alternative to Claret paint. The “Did you mean” search suggestions on sites like Amazon and Google are good examples of this. Amazon suggests related searches and products that closely match your search to keep you from leaving. Put quite simply: your site search tells you what your visitors want without you even having to ask! How can you afford not to use that resource? A lot of time and money is spent on link building and ads on the web, and the easiest way to determine if they’re working is to see where your visitors are coming from. Bloggers, for example, spend time writing for other blogs, commenting in various places, taking ads out on other sites and sharing things via social media. Therefore, it makes sense that you keep track of where you get the most returns to make a wise decision where to focus your efforts. A properly set-up analytics account integrated with eCommerce tracking and adwords accounts can even show you a direct return on investment for your individual adword campaigns; a brilliantly useful tool for managing your pay per click ads. To track all of this and make your life easier, it really helps to set up your analytics software. Properly setting up funnels, site search tracking, eCommerce tracking and ad words tracking should be priorities. Share your thoughts, tips and opinions in the comments! Amazing Computer Concept Designs You Wish Were Real	Welcome to Design Instruct!